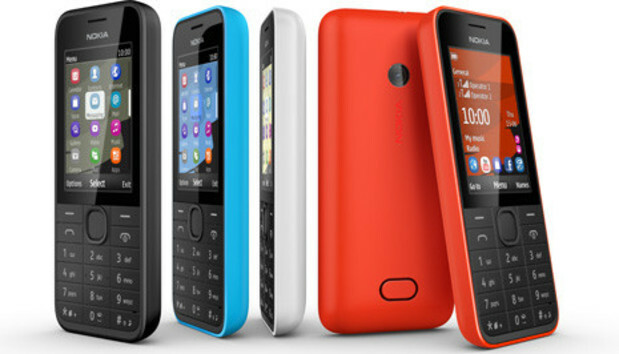 Nokia's latest low-cost phones, the 207 and 208, have integrated support for social networking as well as Exchange and can be turned into a USB modem. While Nokia is doing its best to convince smartphone buyers to choose Windows Phone over Android and iOS, the company has also continued to expand its portfolio of so-called feature, or low-end, phones. The Nokia 207 and 208 both have a numeric keypad and a 2.4-inch screen. They also access the Internet using HSPA and Nokia's Xpress Browser, which compresses data before sending it to the phone. They can also be used as a USB modem with a laptop. There isn't much to tell the two phones apart, at least when looking at the front. The differences between them is that the 208 has a camera and there is a version with two SIM cards. Users can switch between the two cards without turning off the device, to take advantage of more favorable tariffs, Nokia said. The 207, on the other hand, has a single SIM card and no camera. A phone without a camera isn't very common these days, but that makes the 207 a good fit for people who work in places that ban camera phones on security grounds, according to Nokia. Just like it has on other recent products in this segment, Nokia highlighted the availability of adapted versions of popular smartphone apps. This time the company has integrated YouTube, Twitter, Facebook and WhatsApp. The latter will initially be available for the version of the 208 that offers one SIM card. For enterprise users, Mail for Exchange is fully supported, according to Nokia. The camera on the 208 has a 1.3-megapixel resolution and includes features such as voice-guided self-portrait, sequential shot and panorama mode. For those considering one of the two phones as a secondary device, an important new feature is that it uses a micro SIM card -- a size that is used by most smartphones -- rather than the full-sized versions, according to Nokia. One of major advantage with feature phones over smartphones is battery life. The 207 and 208 have up to 33 days of standby time. People who choose the dual-SIM version of the 208 have to make do with up to 20 days, according to Nokia. Before local taxes and operator subsidies, the 207 and 208 will cost about US$68. They are expected to start shipping during third quarter. Nokia didn't offer much detail about where the phones will be available, but the 207 will ship in Europe, it said. On Wednesday, Nokia also released a beta version of Here Maps for the Asha 501. This version has been specifically designed for devices without GPS.